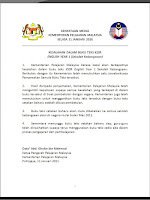 Ministry Of Education Malaysia (MOE) in a media statement has regretted that there is mistake found in KSSR English Year 1 SK Textbook. MOE decided that all the mistakes in the textbook would be corrected. The new textbook will be printed and distributed out to nationwide in Mac 2010. In the meantime, teachers are required to used the current textbook for teaching.